After major population increases in non-metro counties in the 1980s and 1990s, and a moderate increase in the first half of the last decade, the number of people living in non-metropolitan counties declined last year for the first time since the Census Bureau started estimating county populations, reports the Economic Research Service of the Department of Agriculture. 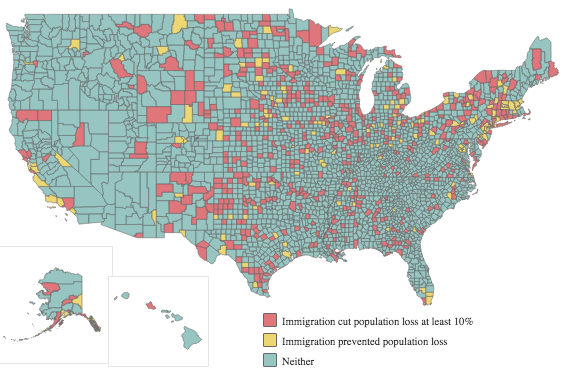 ERS analyzed the census estimates and found that from July 2011 to July 2012 population in non-metro counties fell 0.2 percent, meaning more people died or moved away than were born in or migrated to those counties. From April 2010 to July 2012, the decline was 0.1 percent. The Daily Yonder notes that the Census Bureau started estimating county populations in the 1960s. While ERS geographer John Cromartie writes that this is "a historic shift," It should be noted that non-metro counties do not contain all the rural population, much of which lives in rural census tracts of counties that have been placed within metro areas because more than a fourth of their workforce commutes to the area's core counties. Such counties tend to be gaining population, not losing it. "Historically, non-metro population grew because natural increase (more births than deaths) always offset net migration loss (more people moving out than moving in)," Cromartie writes on the agency's Amber Waves. "But falling birth rates and an aging population have steadily dampened the natural increase in non-metro population over time." Migration rates peaked in 2006, right before the housing mortgage crisis. 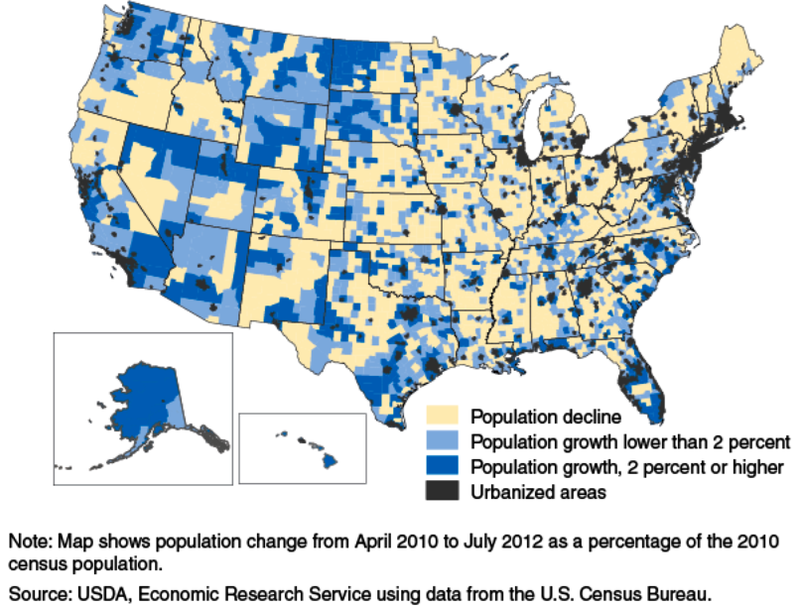 (Read more) Here's a county map of rural population trends; click on it for a larger image. Gray wolves in northern Michigan. Gov. Rick Snyder signed legislation Wednesday allowing the Michigan Natural Resources Commission to determine which species of wolf are considered game, thus blocking efforts by an animal-rights group to try to overturn a 2012 wolf-hunting law, reports Gary Heinlein for The Detroit News. Keep Michigan Wolves Protected had asked the commission to delay any decision on wolf hunting until after the 2014 election, and to force a re-vote on the hunting law passed in December, reports Heinlein. The new law ends any hope of that. A tree infected with citrus greening. Florida's citrus industry could be wiped out if a cure isn't found for a disease that has cost the state $4.5 billion and 8,000 jobs since 2006, reports Lizette Alvarez for The New York Times. The disease, called citrus greening, is spread by a tiny insect, the Asian citrus psyllid, and starves trees of nutrients, causing fruit to turn bitter and fall from trees before it's ripe. The disease has also been reported in Texas, California and Arizona. Sherry Tomason, who worked for seven years in onion fields in Georgia, before recently quitting and joining a federal lawsuit against Stanley Farms, told Bronner the company likes to hire "Mexicans because they are scared and will do anything they tell them to." In another suit, Americans say they were "fired because of their race and national origin, given less desirable jobs and provided with fewer work opportunities than Mexican guest workers." The Senateimmigration bill has special concessions for illegal immigrants who are experienced farm or agriculture workers, making it easier for them to obtain a green card and move closer to citizenship, which we reported here. The Democratic governor of Kentucky, a state with many rural people, some of the nation's worst health and little love for President Obama, announced today that he would expand the state's Medicaid program with money from the president's health-care reform. "Today we change the course of Kentucky's history," Steve Beshear said as he began a state Capitol press conference. He said the expansion, along with health insurance and subsidies available through a state-run exchange, would give the state a healthier workforce, more money for its health-care providers, more jobs in health care, improved health status and a better image. "Expanding Medicaid will help create a stronger Kentucky," he said. 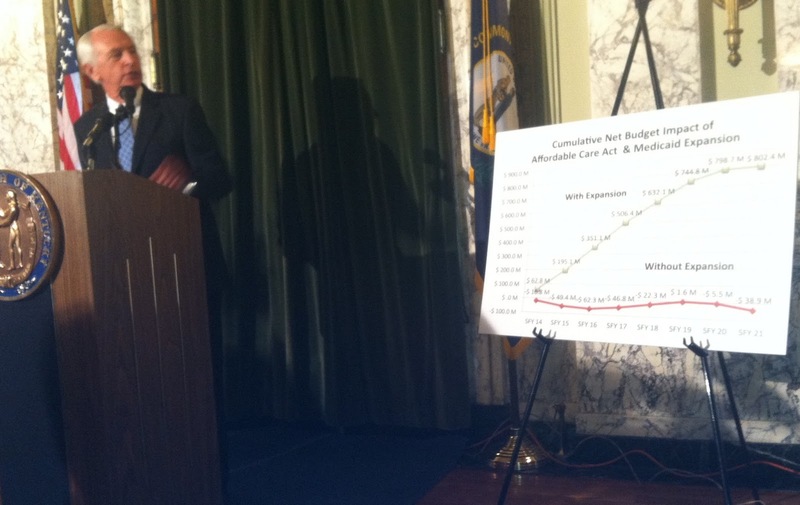 Beshear said Kentucky is the 21st state to expand Medicaid under the Patient Protection and Affordable Care Act. Asked why more governors have not, he said that was "based mainly on partisan politics." Earlier, anticipating Republican criticism, he said some critics "express broad and vague anxieties . . . . fall back on national politics" and say expansion supports "Obamacare. To them I say, 'Get over it.'" Obama lost Kentucky by wide margins in both elections. There is little that Kentucky Republicans can do to stop the expansion. They control the state Senate, but Medicaid eligibility and benefit decisions belong to the executive branch, and even if a bipartisan legislative committee were to block the implementing regulations, Beshear could override it. For details and background from the governor's office, click here. For a news analysis by the undersigned, go here. Unemployment rates in rural America are falling, but the number of jobs is also declining, reports Bill Bishop of the Daily Yonder. From March 2012 to March 2013, the rural unemployment rate dropped from 8.7 percent to 8.3 percent, but jobs declined by more than 55,000, with 60 percent of counties reporting a decrease in jobs. Apparently,the workforce in those areas is shrinking, from people dropping out or moving out. Almost all the jobs were lost in towns with fewer than 10,000 people, Bishop reports. The unemployment rate in rural America is now higher than in urban areas, where the unemployment rate fell from 8 percent to 7.6 percent. Jobs in urban areas are also flourishing, with an increase of 1.2 million jobs since March 2012. The Yonder map links to an interactive version with county data. As the debate continues whether or not to cancel most Saturday mail delivery, letter carriers across the nation will spend this Saturday collecting food donations to help the needy. They say the food drive is a chance to help promote their work among the community, especially on a day that the Postal Service wants to eliminate most delivery -- a move that would cost some carriers their jobs. Portland, Ore., Postmaster Shawneen Betha said, "The Food Drive gives everyone the chance to be part of something bigger than anything we could do alone," reports Scott Hewitt for The Columbian in Vancouver, Wash. "It's our Postal Service customers who really make the difference. Every can and package of food collected makes a difference in someone's life." While rural interests generally favor Saturday mail, which will continue until at least Sept. 30, some suburban customers don't favor it. The Journal News, in suburban New York, published a letter from reader Arthur Praete that said, "Not more than two Americans out of 100 would sorely miss Saturday mail delivery. And what does this Congress do? They pass legislation prohibiting the Postal Service from instituting this cost-saving reform." Postmaster General Patrick R. Donahoe has said eliminating Saturday mail could save the agency $2 billion a year. The Postal Service lost $15.9 billion last year. Rep. Rush Holt of New Jersey, the ranking Democrat on the House Natural Resources Committee's Energy and Mineral Resources Subcommittee, criticized President Obama Wednesday, saying he caved under industry pressure by submitting a proposal that weakens regulations of hydraulic fracturing on public land, reports Mike Soraghan of Environment and Energy News. "The proposed fracking rule is intended to update rules for oil and gas drilling on federal land by requiring disclosure of the chemicals that companies inject underground, bolstering standards for ensuring that wells do not leak and requiring that wastewater is properly managed," reports Soraghan. Interior Secretary Sally Jewell denied Holt's accusations, "telling reporters this week that industry pressure had nothing to with the significant changes to the rule that surfaced earlier this year," Soraghan reports. We wrote here about the deal reached between hydraulic fracturing companies and environmentalists. Caves in the region's national forests and grasslands (see the Forest Service website) will re-open Aug. 1, under a management plan that "includes various restrictions, depending on where bats hibernate and how close the caves are to outbreaks of white-nose syndrome. Environmental groups call the decision shortsighted," Keller reports. "Some scientists think that the disease might not take hold in the West, because Western caves may be too warm and dry for the cold-loving fungus, and hibernation colonies tend to be small and far apart." The fungus has been reported in Oklahoma. Last week, the fungus was discovered in Daniel Boone National Forest in Kentucky, reports the Lexington Herald-Leader, and we reported in March that the disease has been found in 22 states. Bats contracting the disease have a mortality rate of 70 to 100 percent. The disease does not appear to affect humans. Dead bodies, or often just human remains, are being discovered at an alarming rate in a South Texas county 70 miles north of the Mexican border, and the majority of the dead are not illegal aliens from Mexico, but Central America, reports Nick Miroff for The Washington Post. Last year 129 bodies, assumed to be migrants illegally crossing the border, were found in rural Brooks County. Deaths are on pace to more than double this year. We reported last week that a government crackdown to stop people from crossing the border through cities or in vehicles has led to an increase of foot traffic in rural areas. Brooks County is in the Rio Grande Valley, which in 2012 had the highest number of illegal alien apprehensions of anywhere in the country at more than 49,000, nearly three times as many as the next highest area, Tuscon, which had 17,000. The Post created this graphic with information from the U.S. Border Patrol and the Brooks County Sheriff's Office. The Vicksburg Post, a historic newspaper in an even more historic town on the Mississippi River, has been sold to an affiliate of Boone Newspapers, which has continued to buy papers in the last few years. Founded 130 years ago, the Post was the oldest family-owned paper in the state, according to Mississippi Press Association Executive Director Layne Bruce. The daily has "survived depressions, wars, floods, tornadoes, bad economic times, many competitive newspapers and assorted ups and downs," says its website. The paper has produced six MPA presidents, including three members of the Cashman family and General Manager Jimmy Clark, who will keep his job. Editor and Publisher Pat Cashman, great-grandson of founder John Cashman, is retiring at 62. He said, "It's a bittersweet moment. I obviously would retire some time, but I think the time is right now. The Boone group has a record of keeping strong community newspaper and that is why we chose them." Alabama-based Boone now owns and manages 45 newspapers and 26 magazines in Mississippi, Alabama, Georgia, North Carolina, Virginia, Ohio, Michigan and Minnesota. The Post's story about its sale is behind a pay wall; not so the one in the Boone-owned Natchez Democrat. The sale price was not disclosed; the deal includes the Post's real estate. When people think of Hispanics, especially those immigrating to the U.S., they typically assume it means Mexicans. While Mexicans make up 60 percent, or 32 million, of the Hispanics living in the U.S., many more Hispanic nationalities are represented in the U.S., and some are emigrating at a much faster rate than Mexicans, according to a study by Brown University, reports the Journalist's Resource at Harvard University. Education researcher Caitlin Howley orpined for the Daily Yonder that President Obama's proposed budget favors urban children and could be harmful to rural children. John White, deputy assistant secretary for rural outreach for the Department of Education, has responded, calling her "analysis fairly narrow and incomplete," reports Diette Courrégé Casey for Education Week. White said Howley's piece, excerpted on The Rural Blog, only referenced parts of his proposal, leaving out key elements that could help rural children, "such as initiatives in preschool education, college affordability, school safety, and K-12 reforms," reports Casey. A program originated by Agstar Financial Services in Minnesota is forming public-private partnerships, bringing small businesses and small towns together with state government, non-profit groups and the U.S. Department of Agriculture to promote rural development. Called the Rural Capital Network, The $6.5 million investment has resulted in an increase in jobs and the economy in rural America, reports Agri-Pulse, a Washington newsletter. John Monson, AgStar's senior vice president for investments in rural America, said the program creates an average of 93 jobs for each $20 million investment and has made $566 million in investments in the past five years. The program, though, could be in trouble. President Obama's budget "zeroed out the guaranteed loan program that the Department of Agriculture uses to support partnerships like those coordinated by AgStar," Agri-Pulse reports. Agri-Pulse is subscription-only, but offers a free trial here. The Ag-Star website is available here. Senators have responded to the proposed immigration bill by filing 301 potential amendments, "including measures to grant Congress more authority over security along the border with Mexico, to require illegal immigrants to provide DNA samples before gaining legal status, and to reduce the number of undocumented workers who would be eligible to pursue citizenship," report Ed O'Keefe and David Nakamura for The Washington Post. The bill includes a new "blue card" program that would allow experienced farm and agriculture workers who are in the country illegally the opportunity to move closer to obtaining a green card and legal residency, more quickly than most other workers. Placer mining involves excavation, sifting or washing of alluvial deposits for minerals, usually precious onces such as gold. The 1872 General Mining Law "prioritizes mining above all other land uses," Swearingen writes, but the Mining Claims Rights Restoration Act of 1955 lets the federal government challenge placer miners potential hydropower sites. North Fork, Idaho, is one of the few places where the areas overlap. So far, the government is winning the battle. The federal designation of "critical access hospital" has kept open many rural hospitals, but the program could be cut back and they need to plan for the future by expanding their role in health promotion and disease prevention, speakers said at an event just before the National Rural Health Association conference opened in Louisville this evening. "Hospitals in general are going away" in rural America, Dr. Wayne Myers, left, first head of the federal Office of Rural Health Policy, warned the audience at a seminar held by the Kentucky Rural Health Association and the Foundation for a Healthy Kentucky. "The old models aren't working too well," Myers argued, saying "What people don't realize is that [critical-access] hospitals get three-fourths of their money from the outpatient department" and have relatively few traditional admissions. He said half of them have fewer than four acute-care patients per day, and fewer than two patients who are recuperating or getting skilled-nursing care. President Obama's proposed budget calls for revoking the CAH status of some hospitals, and rural political clout has declined with the rural share of the nation's population, Myers noted. Then he displayed maps showing that life expectancies of rural Americans are not keeping pace with the rest of the country, and in some areas are declining. "That's really scary," he said. Myers said those trends mean that CAHs should add health promotion and disease prevention to their job description, and Medicare and Medicaid -- which provide 85 percent of their revenue -- should pay them for performing that function. He said hospitals have space, expertise and equipment to serve as exercise and medical-education centers, while most rural health departments are "overwhelmed" with a wide array of duties. The federal payments for disease prevention and health promotion could be limited to hospitals in counties that have a certain percentage of their population on government-subsidized insurance, he said. A CAH designation gives a hospital greater reimbursement in return for its limiting beds, procedures and patient stays. Other speakers called for new approaches in rural health, despite obstacles. "Change is not easy. . . . Almost all federal policy tends to shortchange rural, at least initially," said Craig Blakely, dean of the University of Louisville's School of Public Health and Information Sciences. He said two important targets for prevention activities in rural America are smoking and obesity, which he said is exacerbated by high soft-drink consumption. Soft drinks are a $57-billion-a-year industry, jhe said, "so there's a lot of pushback we're going to be facing if we want to take that on." Blakely added that much of rural America is poor, and that is associated with poor health, so rural health providers also need to focus on education and employment opportunities for their communities. Highway traffic fatalities rose last year for the first time since 2006, increasing 5.6 percent over 2011 to more than 34,000 deaths, according to the National Highway Traffic Safety Administration, reports Daniel C. Vock for Stateline. Almost half the deaths occurred in the first three months of 2012. The report offered no explanation for the increase. A high percentage of the deaths occurred on rural roads, and in many cases, passengers were not wearing seat belts. In 2006 there were 42,708 highway deaths, according to the report. Numbers dropped each of the next five years, falling to 32,367 in 2011. New England had the highest increase last year, at 15 percent. NHTSA's southwest region (Texas, New Mexico, Oklahoma, Louisiana, Mississippi) increased by 10 percent, and California and Arizona rose 9 percent. State-by-state analysis was not available. We have reported that drivers are more likely to die on a rural road than other roads. One week after the Environmental Working Group released a study concluding that taxpayers overpaid nearly $7 billion to farmers for crop insurance, more than 30 agriculture, conservation and wildlife groups have come together to insure the proposed Farm Bill allows them to continue receiving crop-insurance benefits. The groups want to remove language from an amendment to reduce premium subsidies by 15 percent for farmers who earn more than $750,000 in adjusted gross income, reports Chris Clayton for DTN/The Progressive Farmer. The amendment would affect only 1,500 farm operations and is estimated to save around $1.2 billion over 10 years. UPDATE, May 9: "House Agriculture Committee Chairman Frank Lucas is opposed to the agreement," Clayton reports. Lucas said he has a philosophical problem with various lobby groups "tying strings to how farmers farm" and dictating terms to producers when the farm bill is supposed to be about raising food and fiber. . . . Lucas said he is concerned about provisions such as the compliance agreement that would possibly reduce farm production right now." Recent tragedies such as the Connecticut school massacre, the Boston Marathon bombing and the accidental shooting death of a 2-year-old in Kentucky by her 5-year-old brother have led to concern about how media outlets should cover news stories that involve the death of children. The Journalism Center on Children and Families at the University of Maryland's Philip Merrill College of Journalism has released a module offering advice to journalists on covering these sensitive issues. The module covers areas such as interviewing a child witness or grieving families, writing a child's obituary, determining what photographs are appropriate to use, how close a reporter should get to the families they're covering, and how to cover cases involving juvenile deaths, Ottalini reports. There are also many examples of what not to do. The module can be viewed here. Levels in the state's major source of underground water, the Ogalla Aquifer, located in the Panhandle, fell an average of 3.5 feet, with water levels dropping in 25 of the 26 wells, reports Galbraith. The hardest-hit area was the Trinity Aquifer, in Central Texas, which had an average drop of 19.7 feet, while the Carrizo-Wilcoz Aquifer in South Texas had an average drop of 17.1 feet. Democratic senators from rural areas hope to re-write President Obama's "Race to the Top" program to give rural schools a better chance of competing for federal money. But they are facing stiff opposition from urban senators who are against changing the law, Alexander Bolton reports for The Hill. It doesn't help the rural cause any that the two main advocates of changing the law, Sens. Mark Begich (D-Alaska) and Mark Pryor (D-Ark. ), didn't earn many Democratic friends when they voted against the recent measure to expand gun-sale background checks. The study author, Iowa State University agricultural economist Bruce Babcock, found that through "lavish taxpayer subsidies, farmers have extraordinary incentives to over-insure their crops and dramatically drive up the cost of crop insurance when disaster strikes," Sciammacco writes. The success of the 2012 Kevin Costner mini-series about the Hatfield-McCoy feud has already resulted in an increase of tourists, he writes. Since its airing, "communities along the Tug Fork [of the Big Sandy River], the stream that is the state boundary in the area, have witnessed a surge in out-of-town foot traffic, tourists by the thousands drawn to the region in search of history." Americans' use of mobile media devices keeps rising, and the biggest jumps in the past year have been among people ages 45 to 54 and older than 64, two core groups for print newspaper subscriptions, according to the Reynolds Journalism Institute at the University of Missouri. "More than half (55 percent) overall in 2013 were mobile news consumers compared to 42 percent of respondents overall in 2012," the institute said in a report. "In every age group except for those 65 and older, the percentage of respondents who used mobile media devices to keep up with the news exceeded the percentages of those who used desktop computers for news." Rural newspapers, which rely more on print readership, should note this result: "The aging of print news consumers is clearly evident in our survey results. Last year slightly less than half of the newspaper subscribers were age 55 or older. This year they accounted for 61 percent. The use of mobile media for news has grown rapidly among newspaper subscribers in the past 12 months. . . . For newspapers pursuing a digital-first model, this would seem to lend support for their efforts. But it also may be accelerating the decline of print."